So you just moved into your beautiful new home … and it has a pool too. Great! Owning a swimming pool for the first time is exciting but it can be daunting until you understand the basics of water flow, equipment and chemistry. This article is designed to provide you an overview of a pool’s operation. LESSON 1 – FLOW: A swimming pool is basically a large basin of circulating water. Using a small pump, water is pulled from the pool via the main drain at the bottom of the pool and from the skimmer at the top. The pump pushes this water through a filtration system to remove any dirt. After filtration, the water goes back into the pool, usually coming out through small jet ports on the side of the pool. LESSON 2 – TIMING: A timer mechanism controls when the pool pump is turned on and turned off each day. Usually, a pool pump will run about 8 hours every day of the year. LESSON 3 – POOL EQUIPMENT: Besides a pump, filter and timer, other types of common equipment include heaters, chlorine feeders or generators, automatic controls and pool vacuums. LESSON 4a – POOL CHEMISTRY: Pool water is usually kept clean and sanitary using chlorine – in combination with the pump’s circulation & filter. Chlorine is the best sanitizer and only a low level in the water (2-5 ppm) will kill most germs and algae. Chlorine comes in many forms but the most common is either liquid (stored in yellow jugs) or tablets (shaped like hockey pucks). LESSON 4b – POOL CHEMISTRY: The effectiveness of chlorine as a germ-killer is highly dependent upon the pH of the water (amount of acidity). The pH of pool water should be kept between 7.2 and 7.6 to maximize chlorine effectiveness and swimmer comfort. This is done by adding either acid or a neutralizer to the water. 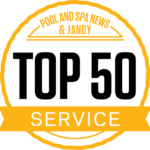 LESSON 5 – CONSIDER HIRING A LICENSED PRO: There are many other aspects of maintaining a healthy swimming pool such as balancing alkalinity, using specialty chemicals, brushing of surfaces, cleaning the filter and maintaining the equipment. 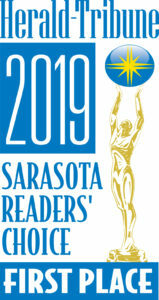 For this reason, it is prudent to hire a professional pool service company to provide weekly cleanings and maintenance. 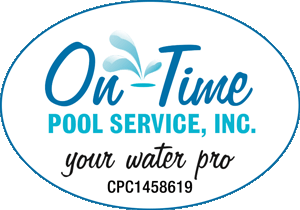 On-Time Pool Service is happy to inspect your pool and answer all your questions regarding pool ownership. Contact us today.